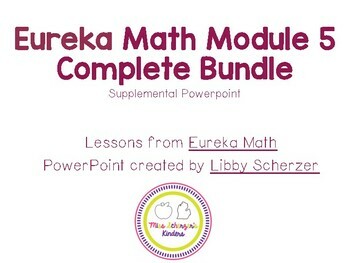 These PowerPoints walk through Eureka Math's Kindergarten Module 5. This bundle contains all topics. 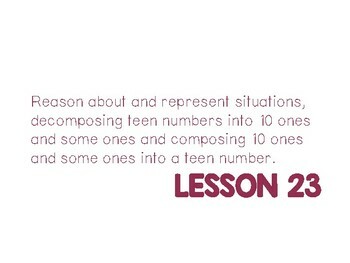 It is meant to help teachers in their planning and instruction by engaging students and allows teachers to have some freedom from the teacher’s guide while still sticking to the scripted lesson created by the Eureka Math authors. 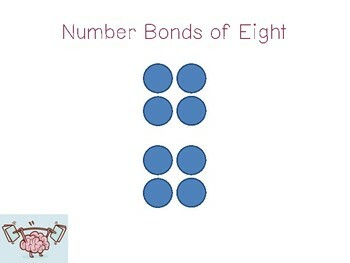 I have found using these PowerPoints have helped to keep pace with these jam-packed lessons! These PowerPoints include all parts of the lesson: Fluency, Application Problem, Concept Development, Problem Set and Student Debrief. In some cases, I may leave out a Fluency in a PowerPoint if I have found the lesson to be a long one. Each lesson starts with the lesson target written as an “I can” statement in Kindergarten friendly language. 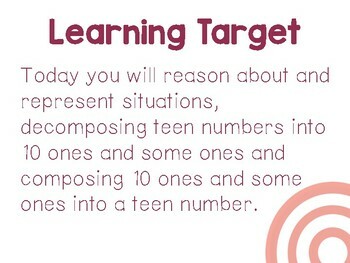 The learning target is revisited again in the middle of the lesson, and finally at the end. Every PowerPoint is created using the free font HelloTracerSolid font from www.jenjonesfonts.com, but can easily be viewed without this font. I have put careful planning into each PowerPoint. I created these first to use with my colleagues and in my classroom and secondly to share with you! After any edits are made I quickly repost a most current version! In this download you will get the PowerPoints, unlocked and allowing for complete editing, as well as the PDF version. If you like this product please leave positive feedback, and check back often—more PowerPoints are coming soon!